You are here: Home / Blog / How Many IP Addresses does an IOT Car need ? How Many IP Addresses does an IOT Car need ? Its true that we are faced with billions of new devices being connected to networks but its not necessary true that every device will need a unique and publicly routable IPv6 address. Lets do a case study on an IOT-enabled car. Lets take predictions that 2 billion cars need IP addresses. Sounds reasonable. Its not mandatory that every car have a public IPv6 address. Cars might connect to an APN on 3G/4G network with private IPv4 addressing and pass through a gateway so that carriers can extract revenue from car makers claiming that an isolated network is a secure network. And if they do, who is going to manage the allocation of those addresses ? Car maker, IOT service or carrier ? Just wondering who is going to own those IPv6 addresses because someone has to. 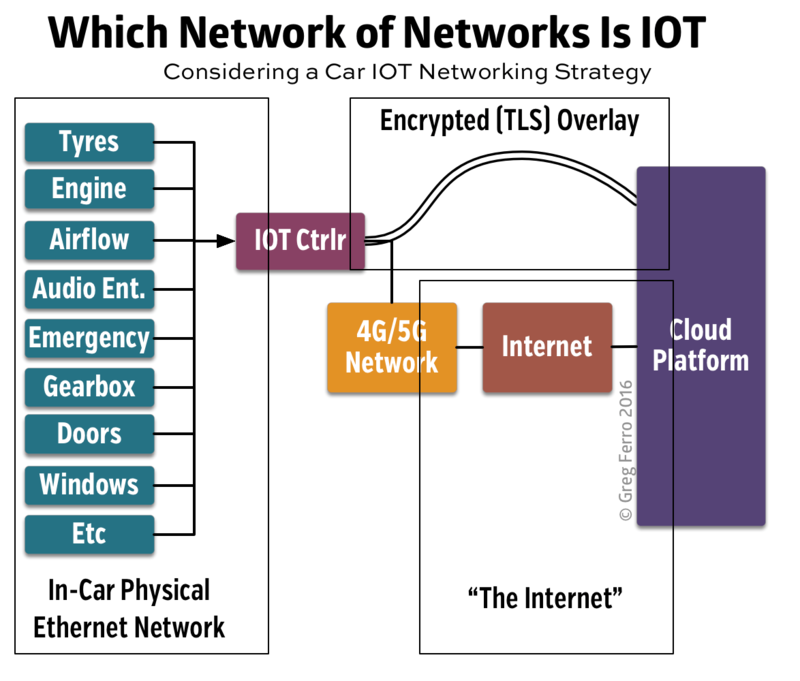 Inside each car is a network of more devices. Components will be connected to an Ethernet network. Today its the car radio, security systems and remote alerting. Tomorrow, its electronic computer management, carburetor, tyres, gearbox etc. Each one of these will need an IP address – do these need to be public IPv6 addresses ? What sort of network architecture would a car have ? Its certainly going to be a network of networks. An overlay network using TLS will act as a gateway for the hundreds of IP addresses on an internal physical network inside the car itself. How Many Addresses Do We Need ? IPv6 isn’t easy to deploy in 2016. The standards are constantly changing which makes it difficult to get it done. Its slowly getting better and its highly probable that anything 5G will IPv6 native but 4G networks are still in a transition zone depending on the carrier and whether customers have upgraded to newer handsets and mobile operating systems. In this case study, how many addresses do you need ? You know the feeling when somebody jumps up and yells with passionate ferviour “we must have IPv6. Everyone should be cancelling everything, immediately, to work on replacing all of their legacy IT equipment.” We’ve all heard it. Yeah, I’ve been hearing that since 2001. I even believed it in 2004 and wasted hundreds of hours of my personal life learning about IPv6 features that have been discontinued, deprecated and should never had been ratified by the IETF. IPv6 is one possible solution. There are others. Stop, think, and challenge the fundamentals. IOT isn’t driving IPv6 transition any more than smartphones, laptops and all the tea the in China did. Car Ethernet is real and been around for a number of years. Here is a podcast we recorded on Packet Pushers in Dec 2012. Autos already use CANbus, so none of that in car stuff needs an IP address. Just an interface or gateway to the CANbus. They have spent years standardising CANbus so it’s unlikely they’ll want to move to a different standard using Ethernet. Its already being done. CANbus is legacy technology because its too slow and expensive to use. Check out the post I lined to about Marvel producing silicon for Gigabit Ethernet for car sensors.